This entry was posted in Drama, Thriller and tagged assassin, film, george clooney, michael clayton, oscar winner, review, reviews, spy, spy thriller, the american, the dies of march. Bookmark the permalink. Hey, good review, but I’ve got to disagree, I honestly thought The American was a great film, 4.5/5 at the least. You begin by criticising the film and the lead character for not being like other spy movies/spys. But then admit that the film doesn’t set out to be like them, so that isn’t really a fault, more just it not being something that you wanted it to be. Plus you mentioned Salt… never mention Salt, in any context. Referring to scenes of Clooney alone as being pointless is a shocking statement. The film tells it’s story from the perspective of Jack, it’s an internal monologue of sorts told visually and equally without them the run time would have been halfed ;). 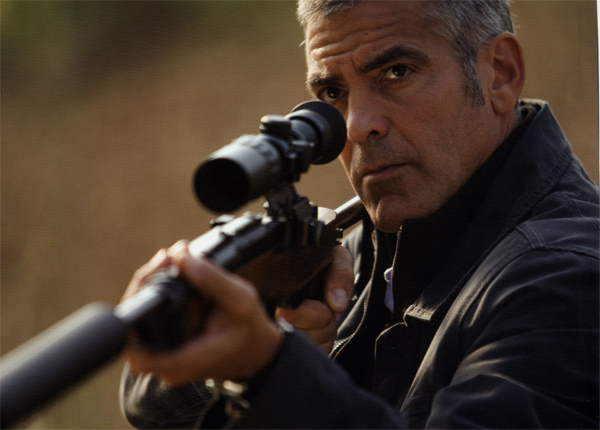 As for your lack of context – Throughout the film, one wonders: why Clooney is in this small town in Italy (because the Swedes found him and tried to kill him in his previous location); who he’s working for (himself and the dude he keeps phoning); who he’s targeting (nobody, he want’s out and is making a weapon for another assassination which he knows very little about, just enough to make the gun); and if he is an asset or a liability to his organisation (he was once an asset, now he’s a liability). To have had these points laboured more than they were would have made the film more like, the one I said we never mention. That would have been a bad thing. Finally you suggest that picture perfect Italy and the paranoia of a spy cannot be entertaining – that is just not true, I was captivated from beginning to end. And to end, I loved this movie and everything it did. To feel that Corbijn let his audience down is naive. Pandering to audiences is what gives us the pulp that is mainstream cinema (some of which I like, don’t get me wrong), but for the most part this can not be what is aspired to by those believing that cinema is an art form. Miles Westwood, you have made many fair points; especially, about the one about mentioning Salt! I appreciate all that you have said. Nevertheless, you still have not addressed the issue of context. Why didn’t the director indicate to us why Clooney was in Italy in the first place? What was his mission? None of this is remotely explained, which is a massive fault, because if the audience is not given the context then they can neither know why he is there or empathise with his situation. I have no problem with an artistic style of film, as we can see from my review of The Skin I Live In. I enjoyed The American for what it was.